Go to the web site for “Stein Collector’s International” and click on “Stein Talk,” someone there might help you. I just do not have the time. My web site was really started as an informational site for beginning beer stein collectors that would be looking for the info and not the general public. The interesting article by Doug Bandow ended with a photo of what appears to be an early ca. 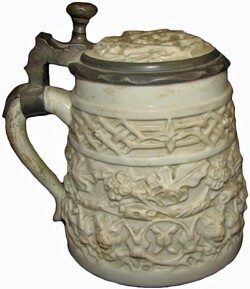 1860’s Villeroy & Boch stein that corresponds to later Mettlach mold number 812 stein shown in the 1885 Mettlach catalog and described as “Jagd” (Hunting) (probably designed by Ludwig Foltz II) with a height of 20.5 cm. 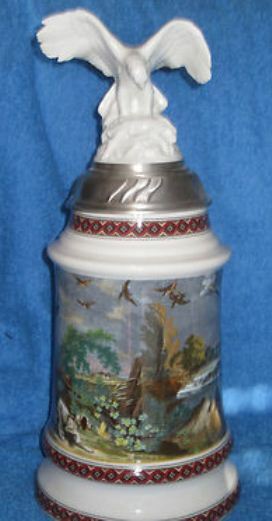 to the lip and capacity of 1.85 L.
The description as probably coming from the V&B Dresden factory is what intrigued me, because the stein appears to be made of porcelain and Dresden, Saxony is definitely in a porcelain making area. This could be confirmed by shining a light thru the side, since porcelain is translucent. 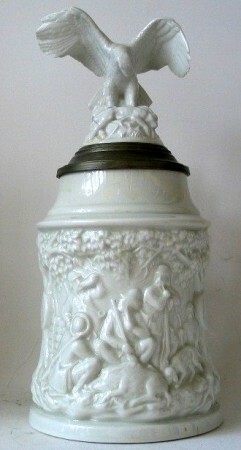 It is also probable that this stein is a copy made from the mold of the original stoneware version and the height to the lip should be less than 20.5 cm. Also note that there will be no capacity mark in liters since the Metric System of measurement was not adopted in Germany until 1875. 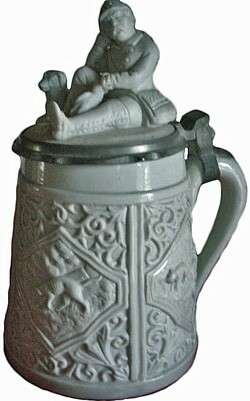 A side view of the stein should show the bugle handle. As I was doing my daily perusal of eBay to find steins with verses to translate for my SCI website “Translations Illustrated” which now has over 900 entries, I ran across a very similar stein in porcelain. 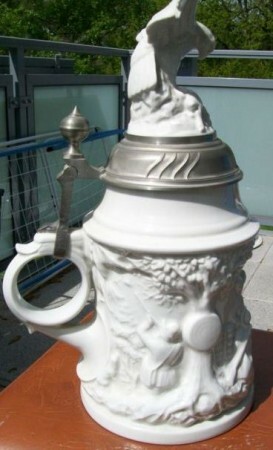 The pewter mounts on the eBay stein looked to be recent and after some enquiries, it turns out that numerous examples of these had been made in recent years somewhere in Germany. The eBay minimum bid price of EU 50.00 unfortunately had not received any bids by the last 8 hrs. of the auction. These steins are very nice in appearance and are good, but recent copies of Mettlach mold number 821 steins by an unknown maker. I would have bid on this one, but the seller would not send to the USA. Recently I have become interested in relief porcelain steins from the third quarter of the nineteenth century and have acquired several. From the pewter marks and some other features, they would seem to be from the areas of Thüringen (Thuringia) and Sachsen (Saxony). This porcelain stein (above▲)has a glazed body, but the lid is bisque. The pewter on the inside of the lid is marked “Wm. Strasburger & Co. – Sonneberg” which is in southern Thuringia. This porcelain stein is marked on the pewter inside the lid “F. Bagge – Coburg” which is in northern Bavaria almost at the border of Thuringia. Since none of the above examples is marked on the body, it is difficult to name a manufacturer. However due to the relatively close proximity of the pewterers to the porcelain making area of Hirschau/Amberg, one or both of the manufactories of E. Kick or Dorfner & Co. could be the manufacturer. For a full writeup of these two steins, see the descriptions under “F. Bagge” and “Wm. Strasburger” in Chris Wheeler’s “Stein Marks”.